Wood stove and fireplace steamers help increase the humidity in the room by putting moisture back into the air, an attribute that is especially beneficial in the dry winter months. You place the steamer on your stove top, fill with water and let it bring moisturizing relief as steam rises from the pot as the heat of your stove warms the water. Besides being functional, steamers also make attractive decorative accents, and the sight of one steaming away on the wood stove lends a homey feel to the room. Visit one of our stores to view the vast array of steamers that we carry and if you don't see something you like, we can order it! 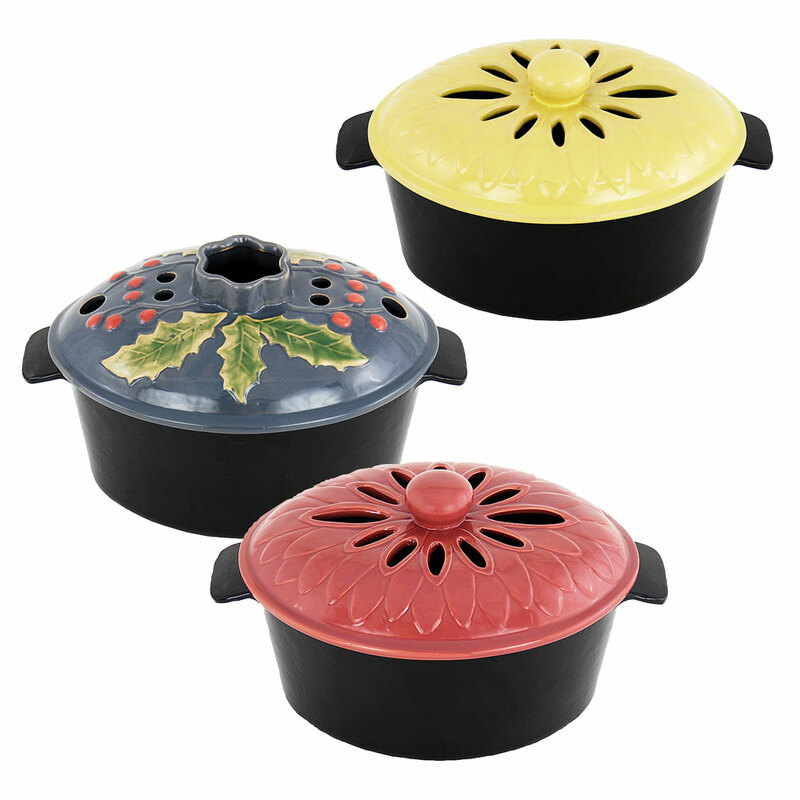 Decorative steamers add a touch of color to your stove and much-needed humidity to a wood-heated home in winter. 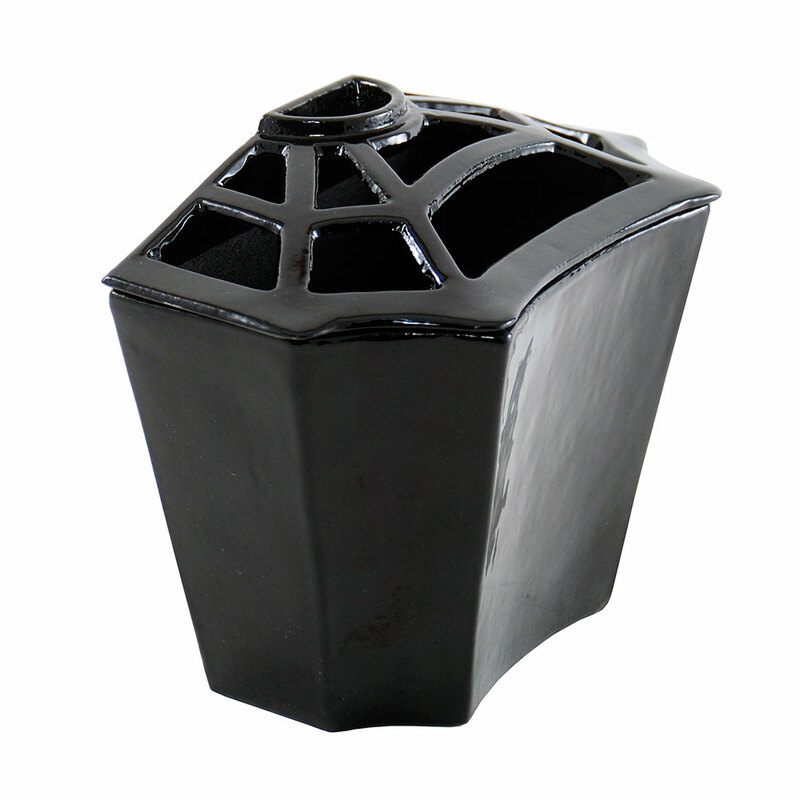 The base is made of durable cast iron with black baked enamel while the top is crafted of high-fired hand painted ceramic. These steamers hold 2.2 quarts of water. Decorative steamers with a lattice top add a dash of color and some much-needed humidity to the wood-heated home. 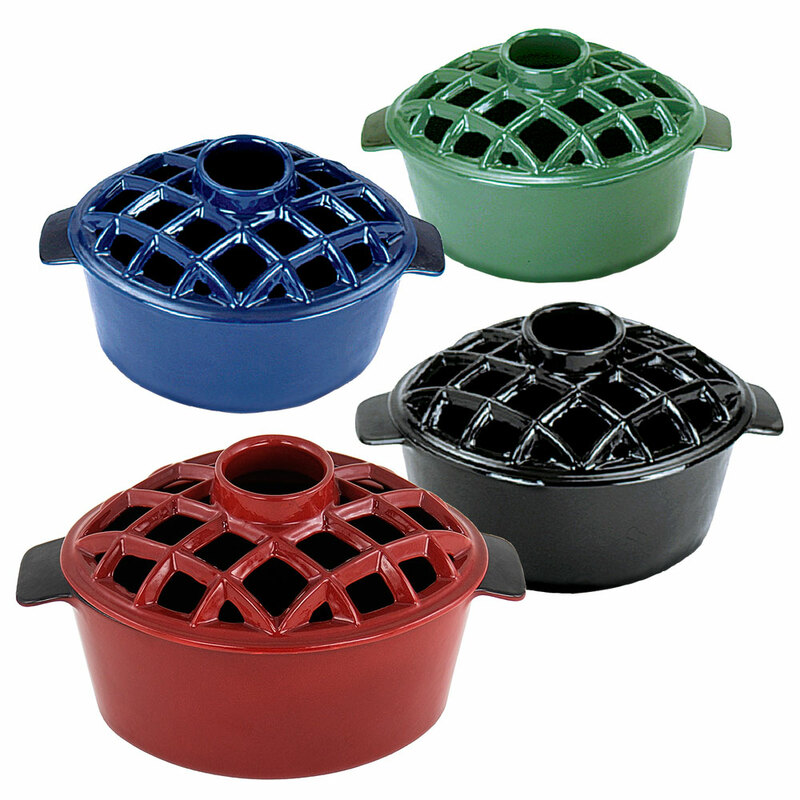 The steamer is made of durable cast iron, comes in five durable enamel colors and holds 2.2 quarts of water. The Moiety Steamer presents a contemporary take on Minuteman International’s classic lattice top steamers. It is specially designed for the narrow ledges or mantel shelves of wood-stove inserts. With its removeable top and 2 quart water capacity, the Moiety steamer serves as a decorative and functional piece. Made of cast iron with baked enamel black finish. John Wright Company, known for its cast iron hardware since 1880, is your source for unique and functional elements that hearken back to simpler times. Practical and beautiful, their vintage steamers add to the ambiance of your home aesthetically and with practical purpose. 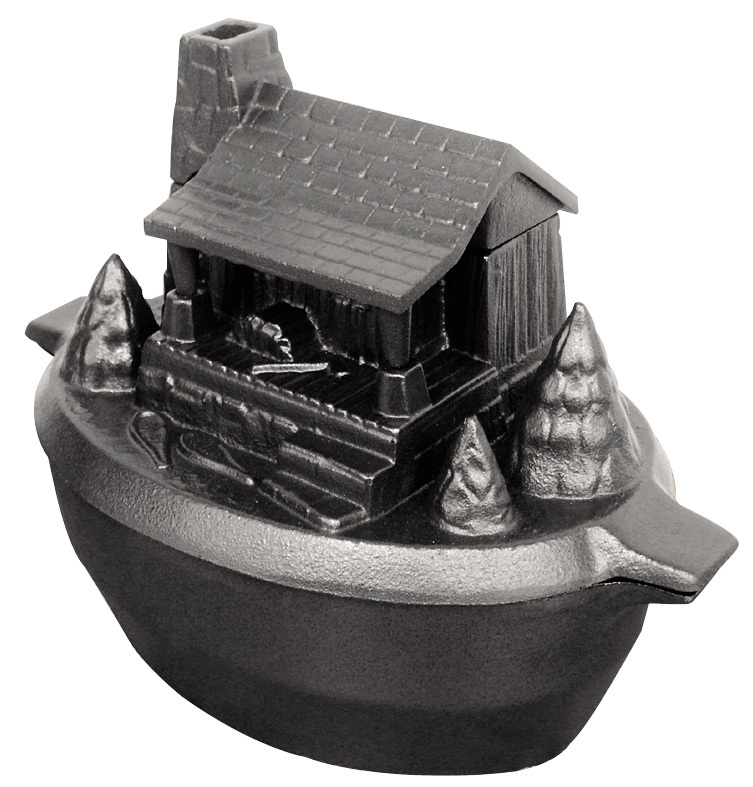 The Log Cabin Steamer is perfect for anyone who loves the outdoors and nature. Made of cast iron, the Log Cabin’s unique, high-quality design features a durable porcelain finish inside and out to resist rusting and chipping. Used for humidifying, it will bring a pleasant fragrance to a room when filled with potpourri. The Bear Steamer, their most popular design, is perfect for anyone who loves the outdoors and nature. 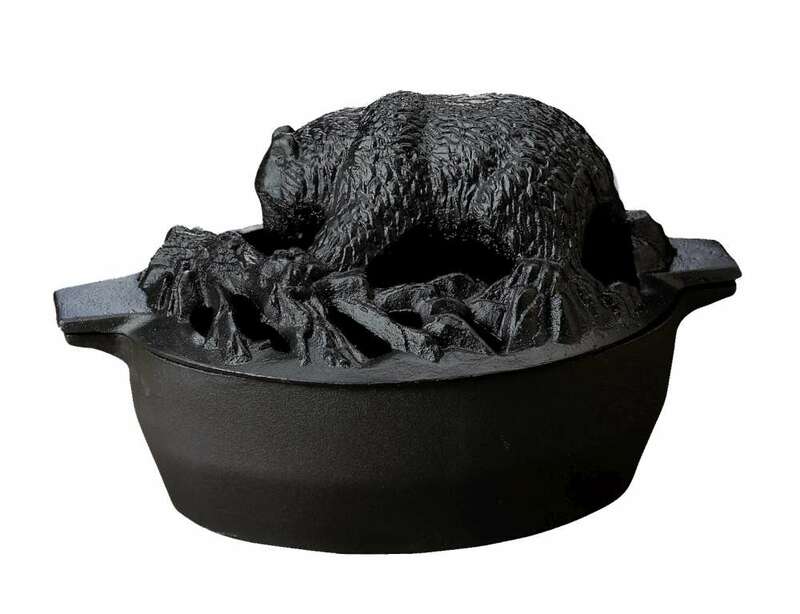 Made of cast iron, the Bear Steamer’s unique, high-quality design features a durable porcelain finish inside and out to resist rusting and chipping. Used for humidifying, it will bring a pleasant fragrance to a room when filled with potpourri. Acorns and leaves create a lattice design on the top of this black matte steamer, giving it a woodsy yet traditional look that will complement any décor. Made of cast iron, the Acorn Steamer features a durable porcelain finish inside and out to resist rusting and chipping. 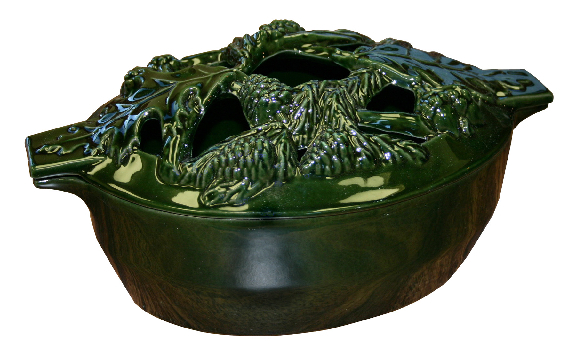 The Majolica technique has a long, rich history in ceramics and produces a deep, rich color with a high gloss. Used for humidifying, it will bring a pleasant fragrance to a room when filled with potpourri.